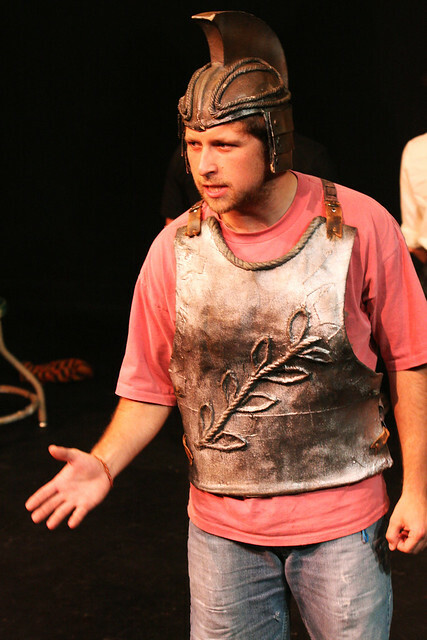 Casey Robbins, who plays Lucullus in the upcoming play, "The Trial of Lucullus," rehearses in the Studio Theatre at SF State on Oct. 13. The play will run from Oct. 27 to 30. Photo by Cindy Waters. Radio brings many things to a modern world like irrelevant one-hit-wonders from the ’90s, that dream doctor show at obsolete hours and … the condemnation of Roman generals to Hades? Assistant professor of musical theater at SF State Barbara Damashek, along with master’s degree graduate coordinator and theater professor Joel Schechter, bring to the stage a re-imagined version of “The Trial of Lucullus,” a play intended for the radio by German dramatist Berolt Brecht. Instead of its original home on the radio, Damashek and Schechter have made it a visual piece by having actors play it all out on an SF State stage this week. The performance details the trial of a harsh Roman general named Lucullus whose fate must be determined: send him to Hades or the Elysian fields where the virtuous and heroic go to rest. Schechter said they had to re-imagine the piece as a whole in order to create a staged version. As a radio adaptation, certain homages to its original format are woven into the new staging of the piece. Most of the winks to radio are subtle, like the unique contrast of pure narration versus dramatized staging, while some, like the “On Air” sign that glows on stage, serve to remind the audience of the piece’s roots. Julia Letzel, a 20-year-old junior and theater major who plays several roles in the performance, said that Schechter and Damashek want to draw a full and informed performance from all the actors. One intricate part of Damashek and Schechter’s co-directed piece is the music, which Damashek looked over as musical director of the performance. Casey Robbins, a 21-year-old theater major who plays Lucullus, said the music is his favorite part. Schechter said that he thinks the political turmoil and questioning of officials is something that speaks directly to current day issues. “There was no Occupy Wall Street or SF when we started, but this does deal with the distribution of wealth among the few versus the many, as well as the actions of government during war time,” Schechter said. Robbins agreed that the message of war was a prevalent one in the piece and also spoke to a very current environment. Robbins said that the ideas were present and relatable, but are never quite addressed in a societal context. Beyond the imaginative staging and stringing together the essence of both radio and theater, Schechter wishes to have audiences leave with more than they came with. “The Trial of Lucullus” will open in the SF State Studio Theater running Oct. 27 and 28 at 8 p.m. and Oct. 29 and 30 at 2 p.m. Tickets are $5.